CLEVELAND (AP) — Empty seats. Anemic football. Bad vibes. Madness has been the norm so far this season. The Browns (2-2-1) have played two overtime games already at home and rallied to win a nationally televised Thursday nighter to end their 19-game winless streak and breathe life into a fan base that couldn’t take much more misery. 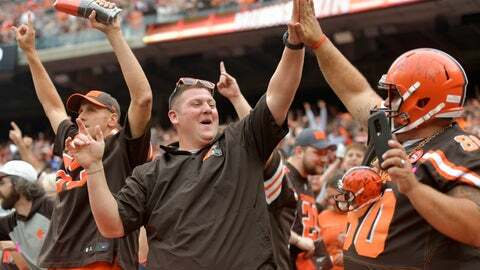 Lifeless for years, the Dawg Pound is howling once more, and Browns coach Hue Jackson begged Cleveland fans to bring the noise for Sunday’s game against the Los Angeles Chargers (3-2). Jackson’s hoping a roaring crowd will make things tougher on Chargers quarterback Philip Rivers, who is off to one of the best starts of his 15-year NFL career. Rivers has thrown 13 touchdown passes and two interceptions, and Jackson believes Cleveland’s crowd can be as disruptive as any of the Browns’ 11 defenders. Rivers often resets his offense before the snap, changing the plays after taking a look at how the defense is aligned. The Browns experienced that last season in a 19-10 loss to the Chargers. Rivers enjoys playing in Cleveland. “It is a great, kind of an old-school NFL atmosphere,” he said. But while the setting may feel dated, Rivers knows there’s nothing out of style about the Browns and their young defense, which is leading the league with 15 takeaways. After playing against the Browns last season, Rivers felt it was just a matter of time before they jelled. This time, the Chargers will also have to deal with a hungry Cleveland crowd that has watched rookie Baker Mayfield lead two wins already. In a season of balls going wide right, wide left and clanking off uprights around the NFL, the Chargers and Browns have had more than their share of kicking issues. The Chargers have missed a league-leading four extra points, the Browns are tied for second with three. The teams are also near the bottom in field-goal accuracy: San Diego is 9 for 12, Cleveland 8 for 12. Chargers coach Anthony Lynn gave kicker Caleb Sturgis a tepid vote of confidence by signing a new holder last week, but Sturgis has been slowed by a quad injury. The team signed Michael Badgley, a rookie from Miami who could kick against the Browns. Meanwhile, Cleveland’s on its second kicker: Greg Joseph, who missed a field goal and PAT last week before knuckling through a 37-yard field goal to beat Baltimore in overtime. Browns wide receiver Jarvis Landry didn’t set out to catch the most passes in league history over his first five seasons. But that’s what he did. Landry surpassed Larry Fitzgerald (426) last week and enters Sunday’s game with 429 receptions. Landry said he idolized Fitzgerald and never considered the mark until he was well on his way. The Browns will honor retired left tackle Joe Thomas , by adding 10,363 — the number of consecutive snaps he played over 11 seasons — into the team’s ring of honor. Thomas never missed a play before suffering a torn triceps midway through last season.